Sunday - February 1, 2015: We returned to Cozy's Cafe in Overland Park for our annual visit. They continue to be very busy at lunch on Sundays and the food was slow coming out, though not quite as bad as 2014 when it took over an hour. The menu has been updated on our review. Added a new page devoted to El Pollo Rey in the Armordale neighborhood of Kansas City, Kansas. They serve only inexpensive grilled chicken meals and Buffalo wings. Monday - February 2, 2015: Added a new page devoted to the Four State Lookout & Wilbur Chapman Monument in White Cloud, Kansas. The Wilbur Chapman Monument is dedicated to an 11 year old boy who raised and sold a pig to raise money to help lepers. His good deed inspired a nationwide program to save money in piggy banks to combat leprosy. 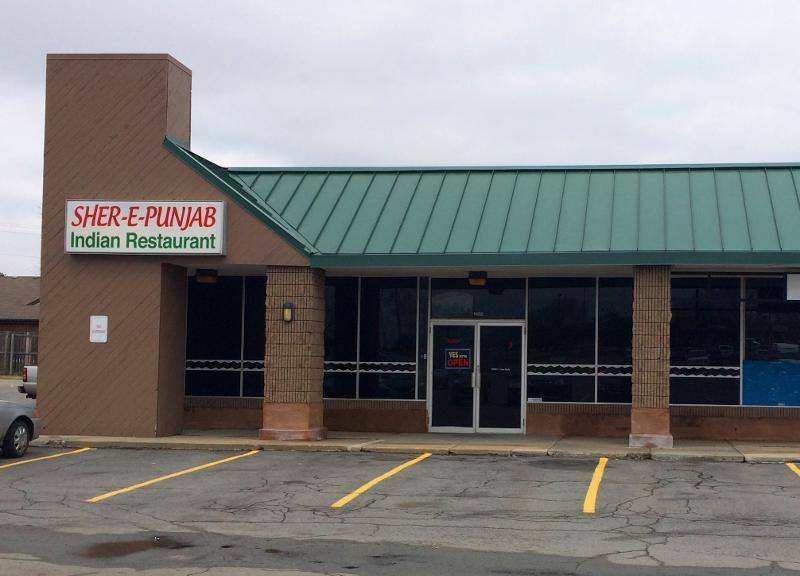 Tuesday - February 3, 2015: I paid a third visit to the new Sher-E-Punjab restaurant in Olathe, which open in December. I had been disappointed with their buffet, but with this being the first Indian restaurant in Olathe, I wanted to try it again, ordering off the menu. It turned out that they were not operating the buffet. Small numbers of customers had resulted in their throwing out a lot of food. The chicken samosas and lamb vindaloo were both quite good, but much too expensive for lunch. My meal came to $20 without a beverage. Until they add some lunch time specials, I recommend dinning there for supper only. Added a new page devoted to the Cray Historical Home Museum in Atchison. Although the museum was established in 1978, it was closed for renovations during the years when I made repeated trips to Atchison to visit all of its attractions. But it is open now. The 25 room 1880 Victoria mansion is very ornate and nicely furnished. Thursday - February 5, 2015: We had supper at Arris' Pizza, which just opened in Lenexa, Kansas on Monday. This is the first location for the Greek pizza restaurant change. The other locations are in Missouri. 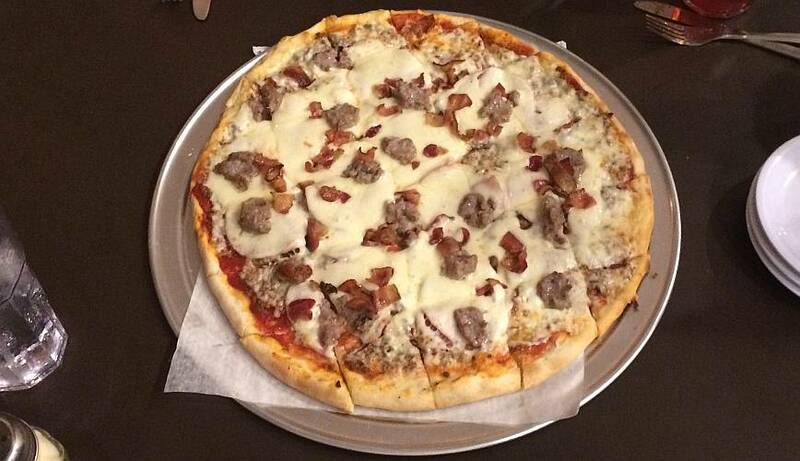 We tried the garlic cheese bread, Buffalo chicken wings and a "Hercules" pizza (ground beef, Canadian bacon, pepperoni, Greek sausage & bacon). The new restaurant still has some rough edges. The garlic cheese bread was only slightly warm and the marinara sauce which came with it was cold. The chicken wings were also only slightly warm and looked pretty ordinary when served, but they did have some pretty good heat, which snuck up on you with the second or third bite. There were four of us and we had different opinions on the thin crust pizza. I didn't care much for the pizza, but some of us thought it was pretty good. The thin crust reminded me of the flavor (but not texture) of saltine crackers. The meats and cheese were OK. There was little sauce and it added little flavor to the pizza. Friday - February 6, 2015: It had been a couple of years since my last visit to The Peanut on 127th Street in Overland Park. The chicken wings the restaurant is known for take 20 minutes, but I called during the drive to the neighborhood bar & grill and a three wing appetizer was ready just a few minutes after I arrived. 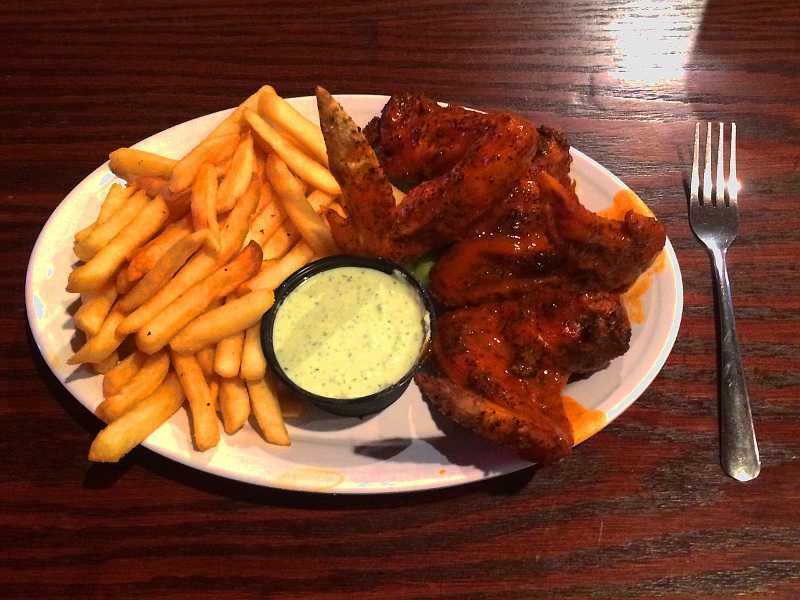 The $7.99 dish includes three large, complete wings as well as fries and house made blue cheese dressing. The fries are nothing special, but the wings are very good. The "appetizer" is a nice sized meal. Saturday - February 7, 2015: As we continue to get caught up on this website, we added a new page devoted to Three Corners - the location of the Kansas, Colorado, Nebraska Tristate Point in the Arikaree Breaks. We had visited Cheyenne County and photographed Three Corners in September of 2011. Sunday - February 8, 2015: Added another page, this one devoted to a neat small town museum which we visited during the same trip in 2011. The Fort Wallace Museum in Wallace, Kansas is pretty impressive for the size and quality of the museum in a town of only 56 people. Monday - February 9, 2015: I revisited and updated the page devoted to Talk of The Town Grill & Bar in Overland Park. It had been almost 2 years since the last time I was there and the menu had quite a few changes. While some items were more or less the same price, several had gone up about 20%. 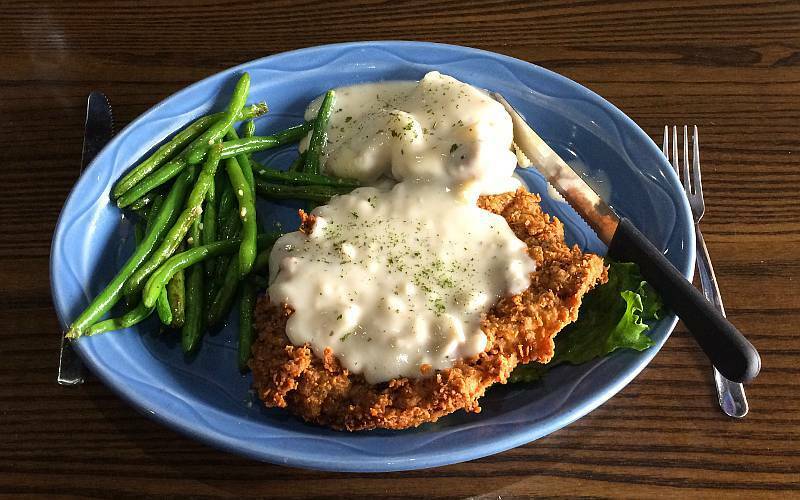 The country fried steak was very good, with a taste, crisp coating. The garlic green beans were also good, with the large tossed salad and mashed potatoes & gravy being less impressive. It was a lot of food for $12. 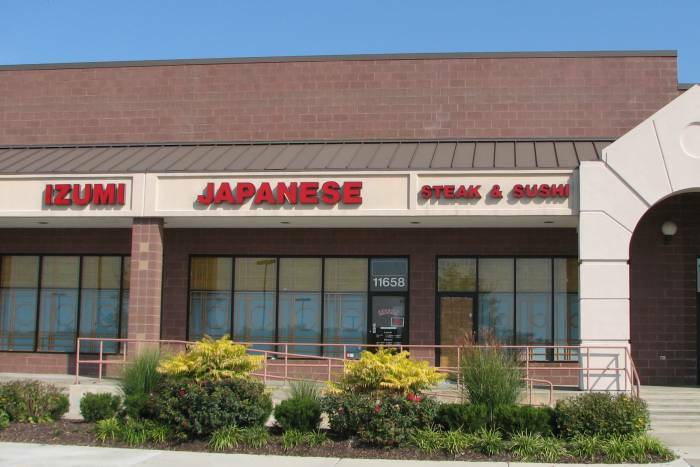 Friday - February 13, 2015: This evening Linda and I revisited Izumi Japanese Steak & Sushi in Overland Park. We had a reservation and despite it being the night before Valentine's Day, we were quickly seated at one of the teppanyaki tables. The chef did a reasonably good, if not stylish job of the table side cooking, with one big failure. When Linda ordered her steak cooked well done, he made a joke about it being done tomorrow. Unfortunately he tried to make that true. He cooked her stead far longer than needed, more than twice as long as the other steaks, and served it tough and dry. The other food was mostly good, with my favorite dish being the spider roll. The teriyaki salmon was also slightly over cooked. 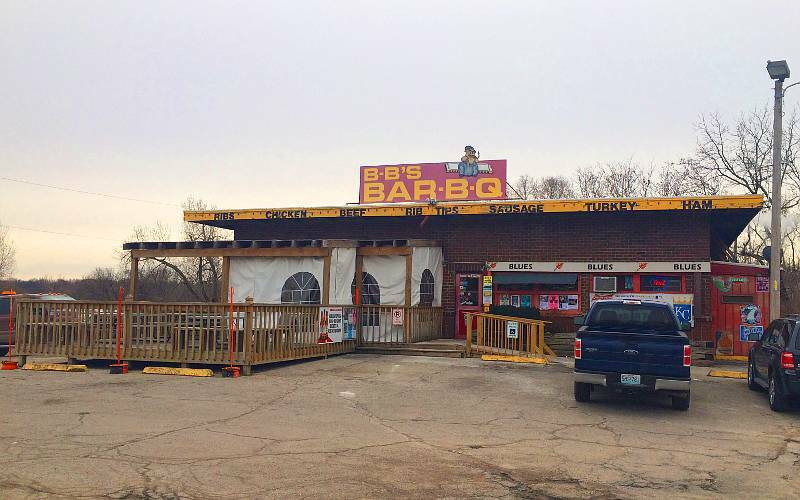 Saturday - February 14, 2015: We added a new review of the Joe's Kansas City Bar-B-Que restaurant in Kansas City, Kansas. This popular restaurant shares space with a gas station and convenience store and recently changed its name from Oklahoma Joe's Barbecue. Sunday - February 15, 2015: Long overdue, we have brought all of our Kansas City BBQ restaurant reviews together on one page so they are easier to find and compare. There are presently 20 reviews from both Kansas and Missouri, plus five archived reviews of KC BBQ restaurants which have closed. Monday - February 16, 2015: I drove to the Missouri State Line to have lunch at Gates Bar-B-Q in Leawood. I had not been there since 2013, but other than the prices creeping up, it was unchanged from previous visits. All three meats sampled (brisket, pork ribs & ham) were tender, moist and had a good flavor from the smoking and dry rub. The thick fries were slightly under cooked for my taste. Gates does not offer table service, but the woman busing the tables in the room where I dined was quite helpful, wrapping up the meat I took away with me and getting me a go cup of soda to take along. Tuesday - February 17, 2015: We added a new page devoted to the Yesterday's Museum in Topeka, which shares a neat old stone building with Henry's Grill and Historic Harley-Davidson. The unusual private museum is devoted to motorcycles. The free museum is open the same hours as the motorcycle dealership. 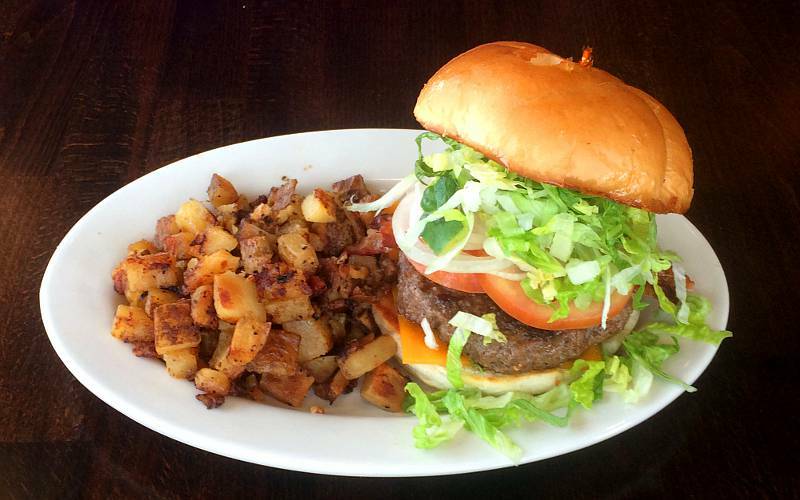 Friday - February 20, 2015: I went to Downtown Diner in Olathe at lunch, so that I could get photo of the new menu, which has several new specialty burgers and some other changes. I had the new burger which has become my favorite - the Sheboygan burger (burger, Swiss cheese, Italian sausage, grilled onions, sauerkraut). It was every bit as good as I remembered when they were testing it out last fall. While I was eating, the owner, Rich Caines brought out some ham that was just off the smoker for me to try. It is a slow process, because the ham must marinate in brine for several hours for each pound of meat. Rich explained that it was from a pig which they raised on a nearby farm, using food which would have been waste at the restaurant for part of the feed. They are now raising all of their pork products, which are butchered at Steve's Meats in De Soto. They intend to raise all of their beef by the end of the year. They are looking for another firm to slaughter and butcher their animals for a few weeks, because Steve's Meats had a fire earlier this week. Added a new review of the Museum of Prairiefire in Overland Park. Saturday - February 21, 2015: We paid a second visit to Slap's BBQ in Kansas City, Kansas and posted a review of the 8 month old barbeque restaurant. This time we sampled many of the other items on the menu. The brisket was dry and just OK. The person carving the meat had added au jus to the pulled pork and it was much better. The sweet sauce went well with the smoked turkey, though that is the only meat which I would use the sauce on. The baked beans were meaty, but a bit too sweet for both of our tastes, but Slap's offers jalapeno pepper slices if you have the beans and I thought the peppers made the beans very good. The ribs were still good this time, but could have used more rub in their preparation (or a different sauce). The sausage was our favorite item, hands down. 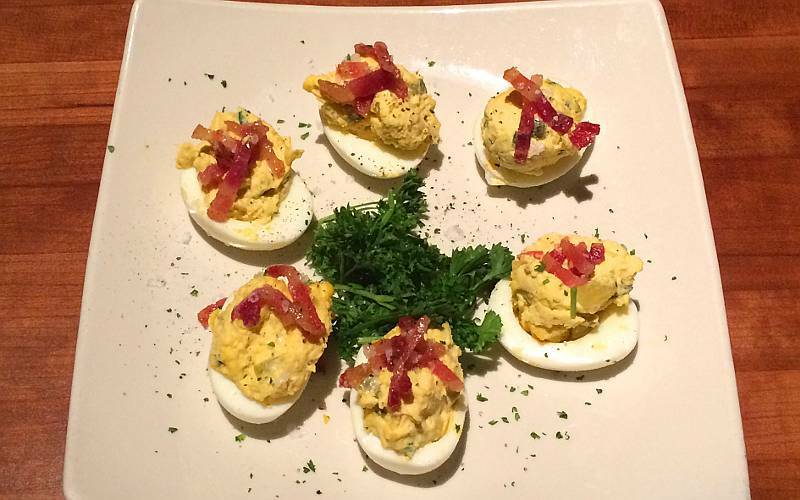 Sunday - February 22, 2015: We had lunch at J. Alexander's to consider it for our Overland Park Restaurant Guide. The restaurant's larger dining room was quite attractive, dark with bright flood lights focused on the tables which gave a feeling of privacy. The menu had many items which looked interesting and the service was outstanding. My hamburger and Linda's steak were both cooked exactly as we ordered, but other than the fabulous deviled eggs which were topped with candied bacon, none of the dishes really came together in a way which we enjoyed. The smoked salmon dip seemed more like salmon tartar. It didn't taste like it had been smoked or cooked at all. The presentations were good, but the burger was on a hard roll rather than a bun and its Kiawah Island dressing didn't work for me. The Madeira sauce on the Steak Brazzo, wasn't a flavor which either of us liked. My shoestring fries were well made, but I'm really not a fan of that style of fries. Other than the eggs, there was no item in the meal which we enjoyed enough to finish. Monday - February 23, 2015: Linda drove to Olathe to join me for lunch at Foody's, a restaurant which opened about a month ago. They are a little unusual in that they don't open until 10:30AM, but then offer breakfast the rest of the day. The short menu is about 1/3 breakfast along with salads, sandwiches and wraps. Their are two registers at the counters and orders are placed at the registers, but brought to the tables. I ordered a $9.49 pork tenderloin sandwich with French fries and was pleased to discover that the tenderloin was not breaded and that the fries were fresh cut. It would be nice to note those things on the menu. Linda had the 7 ounce burger, which came with a choice of 5 cheeses, 4 garnishes and three sauces. It was $8.99 with one side. She chose the roasted potatoes and added cinnamon apples. Those sides and several others are available for only $1.49. Of all the things we sampled, the cinnamon apples were the only disappointment. The rest of the items were all above average. Thursday - February 26, 2015: Wanting to add another review to our Kansas City Barbecue Guide, I had lunch at B.B. 's Lawnside BBQ in Kansas City, Missouri. It had been several years since I last dined at B.B.'s. B.B. 's was busy and has mostly communal tables, but I lucked out and got the only table for two, which happened to be next to the window where it would be easier to photograph the food. Wanting to try some unfamiliar items, I ordered the $19.25 BBQ Meat loaf with green beans and skillet fries, none of which I have had before. The green beans were flavored with spices and parmesan cheese. The meat loaf was a little disappointing after the meat loaf I have had at The Rub in Olathe, but the skillet fries made it all up. They were the best side dish which I have had at B.B. 's, crispy fresh cut, short wedges of potato which were cooked in a skillet with a spicy seasoning. Friday - February 26, 2015: I had a second lunch at B.B. 's Lawnside BBQ. Today I had the Yardbird Combo with a quarter smoked chicken and three pork ribs served with battered fries. The fries were about as I remembered, less done than I like, except for a few of the thinnest ones. I like the skillet fries much more. The ribs were about average among KC BBQ restaurants. The chicken did not have much flavor on its own and B.B. 's sweet sauce isn't the one I really wanted to pair with it. Service was excellent during both visits. Added a new page for B.B. 's Lawnside BBQ. 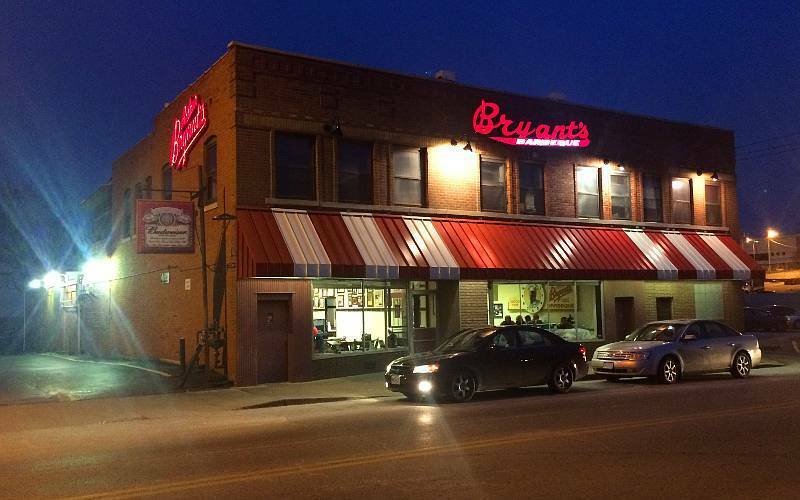 This evening, we returned to Kansas City, Missouri to have supper at the original Arthur Bryant's Barbeque at 18th & Brooklyn. It had been at least a couple of years since we had been to this location and we had no photos from the past 5 years. Linda had a short end of pork ribs, while I had a sliced brisket & pork sandwich. It was a lot of meat. The ribs were good, but both sliced meats were dried out. At most KC BBQ restaurants I add little or no sauce, but at Bryant's I add a lot. The fresh cut fries could have used a few more minutes in the fryer. They took a lot of sauce as well. 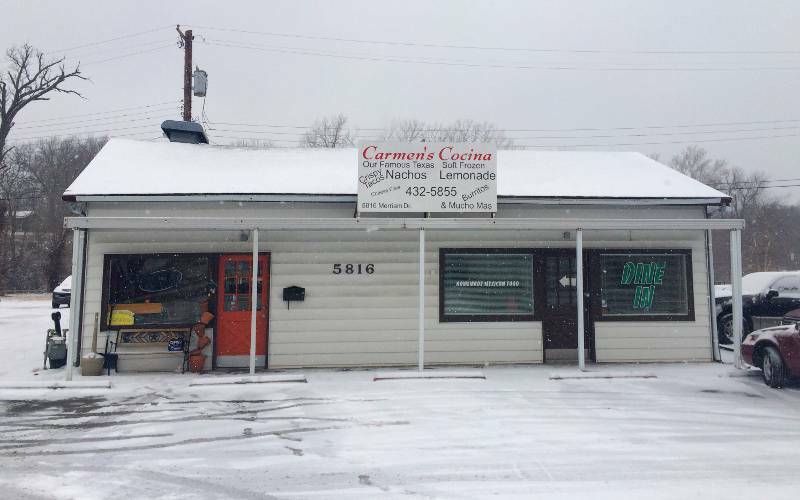 Friday - February 26, 2015: It is a snowy day, so we decided to visit Carmen's Cocina in Merriam, Kansas. Carmen's has just six booths and I had read that they are often crowded. When we arrived, it looked like they were closed, but I parked walked up to check the doors. They were locked, but as I walked back toward the car, a woman opened the door and asked what I wanted. I explained that we were there for lunch and she told me to come on in. They had decided to clean up and go home because the business had all ended about 1PM, but they went ahead and fixed our lunch while they cleaned. We ordered at the counter. Going for a wide range of the small menu, Linda got Kerry's Sampler (chicken enchilada, crispy ground beef taco and beef gordita. I had chicken gordita, two beef tamales, fries with carnie asada and an order of bacon jalapeno wraps. They brought us a basket of thick, tasty, cold chips and salsa while we waited. My favorite dish by far was the bacon wrapped jalapenos. The bacon on the outside and cream cheese filling went well with the cooked peppers. I wouldn't get the fries again. They were OK, but nothing special. All of the other items were good, with the tamales the standouts. Added a new page for Arthur Bryant's Barbeque.